This is a 1915 Moore Trench Pen model 62/6.00 Safety eyedropper-fill in Black Chased Hard Rubber. Cap imprinted “THE INK TAB” with patent dates. Barrel with normal Moore imprints. Cap-top unscrews to access ink pellet storage. Pellets are dropped into the barrel and water is added to make ink, which eliminated the need for soldiers in the trenches to carry ink in glass bottles. The top 1 3/16″ of the cap, which is the pellet storage compartment, unscrews for removal. This component has a visualated oval window to seer the quantity of ink pellets remaining. No signs of use. Medium nib. Near mint+ and fully restored. Item #38 in Catalog #81. 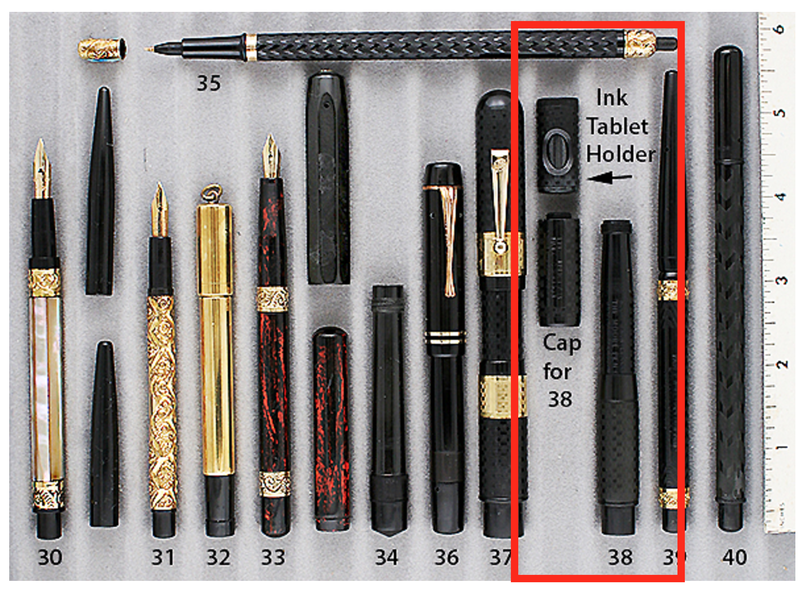 This entry was posted in Vintage Pens and tagged Extraordinary Pens, Moore. Bookmark the permalink. Follow any comments here with the RSS feed for this post. Post a comment or leave a trackback: Trackback URL.